We are a small family boutique hotel with 36 rooms. Our hotel is strictly non-smoking to add to the comfort of our guests. Our aim is to ensure that our weary travellers have a comfortable, cosy and clean room to rest in. All our rooms have attached bathrooms and are equipped with comfortable 11 inch beds, quilts/comforters, air-conditioning, fans, flat screen TVs and hot showers. Wifi is complimentary throughout the Hotel. For our Muslim guests, there is a Surau on the premises and all rooms have "Kiblats" fit by the Jabatan Mufti Perak. We have CCTV monitoring in and around the Hotel to ensure the safety of our guests. We also have ample street parking (parking coupons required) for guests in front of the Hotel. (Please note that during the day the parking lots are subject to Council charges). For our Executive King and Executive Family rooms, we offer spacious rooms, complimentary tea and coffee making facilities, fridge and some complimentary "munchies". The Executive bathrooms are also equipped with bathtubs for those who would like to soak tiredness away after a long day out. For the travelling family, we offer 3 catagories of Family rooms to choose from - The Executive, Deluxe and Standard Family Rooms. All family rooms have a queen and single bed. We have several other category of rooms such as our the Deluxe Queen room, the Standard Queen room, the Superior Single, the Double Single room and the Standard Single room. We are located on the main trunk road between Ipoh and Kuala Lumpur. Using the Highway, we are about 1.5 hours away from Ipoh and about 45 minutes away from Kuala Lumpur. We are 5 minutes from the main Tg Malim township and Universiti Pendidikan Sultan Idris (UPSI). We are also approximately 10 minutes from Polytechnic Sultan Azlan Shah in Behrang, INSTUN and Proton City. The train station is a 3 minute drive from our Hotel. 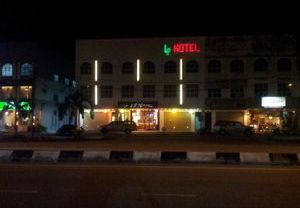 Our Hotel has no restaurant but is conveniently situated next to several eateries (both halal. and non-halal), KFC, petrol stations, banks and convenient stores. We are about 30 minutes from natural hot springs and waterfalls. At LP Hotel Tanjung Malim we are focused on providing our guests with services with the highest levels of guest satisfaction – we will try our bests to meet your expectations. Look around our website and if you have any comments or questions, please feel free to contact us. We hope to see you again! Check back later for new updates to our website. There’s much more to come! Why not us. We offer comfortable and clean rooms to our guests with easy access to restaurants, banks, petrol stations, mini markets and local attractions. Late check-out is subject to availability and at the Management's discretion. Checkout time may be extended to 1:00pm without charge when requested in advance. Extended stay between (subject to availabillity) 1.00 p.m. until 3.00 p.m. will be subjected to half (1/2) of the daily room rate and thereafter will be subjected to full day rate.